TL;DR We go over how to generate a product feed on ROI Hunter for an increase in ROI. You can also learn how to implement pixels for PrestaShop here. Improve your Facebook marketing with Dynamic Ads and automated product feeds! You can easily get them from your e-shop thanks to Shopify apps and it’s super easy to integrate them to ROI Hunter platform. Generate product feed to export your products via URL address, automatically update product information into feed file according to given schedule and sync your products and prices with Facebook ads so that people can always see up-to-date product details. We chose these two apps below but you can find more extension which would suit you best. Check out this little step-by-step guide and get cool eye-catching ads! This “XML Feeds” module automatically generates “PrestaShop” products and categories xml feeds. ► Download and install this extension. 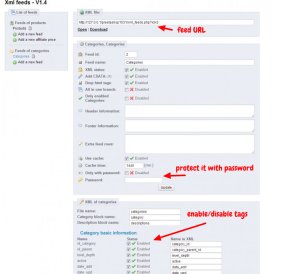 ► If your database is big, you can enable cache, add password on your xml feed, enable or disable fields, which you want to export etc. 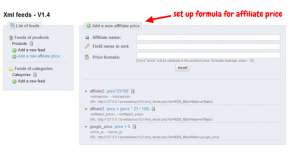 ► Using affiliate systems can provide different prices to different users. You only need to enter the formula for calculating the price (ex. Price + 5). Once you get your feed in any of these formats (xml, csv, tsv, txt, rss), go to ROI Hunter and upload feed into Feed Manager. 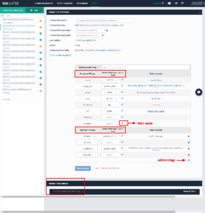 You can also connect Google Analytics profile and track performance of each product directly in ROI Hunter, just make sure product IDs in Analytics are matching IDs in the feed. Also here you can map the feed, replace tags with static values, add more tags and check if there are not any errors after fetching. Magic is done! Let´s create your first dynamic product ads, reach dynamically new customers or use your feed for some nice static ads and measure results precisely in powerful Campaign Manager. Advertise your products within few clicks and keep your data automatically updated! ► Set up Business Manager for your e-shop and assign Business Manager admin role to you in order to be able to create product catalog. There’s no need to create a catalog in Business Manager, simply upload the feed in ROI Hunter and go directly to dynamic ads creative. Product catalog will be create once you send ads to Facebook. Ready…set…go !!! Let´s hunt ROI together! Marketing 5 minute read 4 Scalable Video Advertising Tools You Need In E-commerce Marketing 4 minute read Make Your Slideshow Ads Shine - Add Multiple Images to Your Product Feed [EXAMPLES] Marketing 5 minute read Turn your product feed into a Hero Feed!